Red blood cells (RBCs) carry numerous protein and carbohydrate antigens on their surface. There are over 600 antigens, which are separated into 30 blood group systems. The presence or absence of these antigens in an individual is important, because they determine the type of blood that should be given in case a blood transfusion is necessary. If a person is exposed to blood with different antigens than his or her own, he or she may form antibodies that can result in extravascular and/or intravascular hemolysis when the recipient is reintroduced to the same antigens in a future transfusion. Naturally occurring anti-A and anti-B are the only RBC antibodies in normal human serum or plasma. All others are unexpected and can be divided into alloantibodies (an antibody to an antigen that an individual lacks) and autoantibodies (an antibody to an antigen a person has). The antibody screening test performed in a clinical laboratory and/or blood bank is designed to detect the presence of unexpected antibodies, especially alloantibodies in the serum to antigens of the non-ABO blood group system: Duffy, Kell, Kidd, MNS, P, and certain Rh types that are considered clinically significant. These antibodies can be either immunoglobulin (Ig) M or IgG. IgM antibodies are generally considered to be less significant than IgG, because they are reactive at room temperature but not body temperature and, therefore, rarely cause hemolysis in vivo. The antibody screening test, as part of pretransfusion compatibility testing (see Miscellaneous), along with the type and crossmatch, prevents transfusion reactions such as hemolysis from occurring. Antibody screening is routinely used in conjunction with typing and crossmatch before the administration of blood products, especially RBCs, to avoid transfusion reactions and to prevent notably decreased survival of transfused RBCs. It is also used in antenatal screening to detect the presence of antibodies in a pregnant woman's serum that could result in hemolytic disease of the fetus and newborn. Antibody screening may be performed in advance of a crossmatch to permit early recognition and identification of clinically significant antibodies and thereby permit selection of the appropriate crossmatch procedure and RBC units. The procedure is separated into 3 phases: immediate spin, 37°C, and AHG. The purpose of the immediate spin is to detect "cold" antibodies, usually of the IgM class. 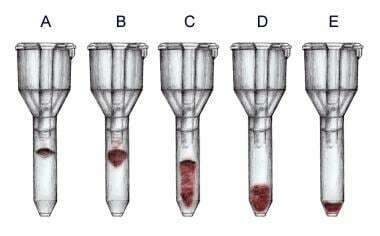 A drop of RBC suspension from each set of the screening cells is placed into a centrifuge tube and mixed with 2 drops of the recipient's plasma. The tubes are then spun for 15 seconds at room temperature to facilitate antigen-antibody interaction. Resuspension of the pellet allows for observation of agglutination or hemolysis. After immediate spin, the tubes are incubated at 37°C. To promote the detection of warm reactive antibodies, especially of the IgG class, additional enhancement techniques such as low ionic strength saline (LISS) and polyethylene glycol (PEG) are often used. LISS is usually added to reduce clustering by Na+ and Cl- ions and speed antigen-antibody attraction. With the addition of LISS, incubation times can be reduced from 30-60 minutes to 10 minutes. [1, 2] PEG, a water-soluble linear polymer, appears to accelerate antibody-RBC binding by steric exclusion of water molecules in the diluents and to promote antibody detection. AHG (indirect antiglobulin test [IAT], indirect Coombs): The tubes are washed 3-4 times with saline to remove any unbound globulins, and AHG is added to each tube. AHG is an animal antibody that binds to the Fc portion of human immunoglobulin. The AHG detects bound RBC antibodies that do not produce direct agglutination (sensitizing antibody). The presence of agglutination with the addition of AHG indicates antibody binding to a specific red cell antigen. The last 2 phases (37°C and AHG phases) are necessary to detect clinically significant IgG antibodies. With column (gel) agglutination (see Methods), the procedure varies by the type of test to be carried out (typing or screening). Patient plasma and reagent RBC suspension are placed at the top of the tube and then centrifuged. With the solid-phase red cell adherence assay (SPRCA), in the first step, a combination of patient plasma and LISS is added to the reagent RBC-coated plate and incubated for a predetermined time (usually 15-60 minutes) to allow binding between antibody and antigen, if present. Afterward, the plate is washed multiple times with phosphate-buffered saline to remove unbound proteins. In the final step, a suspension of indicator RBCs with attached anti-IgG antibodies are added to the well and centrifuged. If the screening result is positive in any of the 3 phases with any of the screening cells, additional tests must be performed to identify the specificity of the antibody. As a result, antigen-negative blood is given to the patient for safe transfusion. In a negative reaction, the pellet passes easily to the bottom, as no agglutination occurs. This is scored as a "0." In a positive reaction, antibodies in the patient's plasma bind to RBCs and obstruct passage to the end of tube. The strongest reaction occurs when the RBCs remain at the top of the tube, scored as a "4+." See the following image. Gel testing. Agglutination is graded on a scale from 0 to 4+. A: 4+ reaction = red blood cell agglutinates (RBCAs) remain at the top of the gel; B: 3+ reaction = RBCAs remain in the top half of the column; C: 2+ reaction = RBCAs are scattered throughout the column; D: 1+ reaction = RBCAs are primarily in the lower half of column; E: 0 = no agglutination and red blood cells pass all the way to the bottom. With SPRCA, a positive reaction is noted by indicator RBCs becoming dispersed throughout the well, because their surface anti-IgG antibodies bind to any antibody attached to the fixed RBCs. In contrast, a negative reaction forms a tight button in the center of the well. Warm autoantibodies are IgG immune responses to a patient's own RBCs, and they are optimally active at 37°C. These warm autoantibodies can be particularly problematic, because they commonly react equally with all reagent cells tested and mask the underlying clinically significant alloantibodies. Further testing such as autoabsorption may be required to remove autoantibodies and to allow identification of other clinically significant antibodies. Cold autoantibodies are of IgM type, and they are generally considered clinically insignificant, because they do not always cause hemolysis in vivo. However, cold autoantibodies are troublesome in that they can interfere with the detection of clinically significant antibodies. Usually, cold antibodies are easy to spot because of their strong reactions to reagent cells during the immediate spin phase but weaker response during the anti-human globulin (AHG) phase. However, in some cases, they are bound tightly to RBCs, resulting in positivity during AHG. To minimize the chances of this occurring, the plasma or serum sample and screening cells should be prewarmed to prevent binding from occurring. Nonspecific antibodies may skew the results of antibody screening. These antibodies are not related to RBC antigens; instead, they can occur from other sources, such as underlying diseases and medications. Antibody screening consists of testing the recipient's plasma against the RBCs of 2 or 3 reagent screening cells that are licensed by the Food and Drug Administration (FDA). The screening cells must be type O with certain profiles for the following antigens: D, C, E, c, e, K, k, Fya, Fyb, Jka, Jkb, M, N, S, s, P1, Lea, and Leb. New technologies such as column (gel) agglutination are beginning to gain widespread use in clinical laboratories. Instead of a test tube, the reactions are carried out in microtubes, which contain a dextran-acrylamide gel. Another commonly used method is the SPRCA. This test utilizes microplate wells coated with the stroma of reagent RBCs of known phenotype. What is an antibody screening test? When are antibody screening tests performed? What are the phases of an antibody screening test procedure? How are antibody screening test results interpreted? What are the limitations of antibody screening tests? Which methods are used to perform antibody screening tests? What is the role of antibody screening in pretransfusion compatibility testing? Roback JD, Combs MR, Grossman B, Hillyer C. Technical Manual of the American Association of Blood Banks. 16th ed. Bethesda, Md: AABB Press; 2008. Petrides M, Stack S, Cooling L, Maes LY. Pretransfusion compatibility testing. Practical Guide to Transfusion Medicine. 2nd ed. Bethesda, Md: AABB Press; 2007. 23-58. Delaflor Weiss E, Chizhevsky V. Implementation of gel testing for antibody screening and identification in a community hospital, a 3-year experience. Lab Medicine. 2005 Aug. 36(8):489-92. Rumsey DH, Ciesielski DJ. New protocols in serologic testing: a review of techniques to meet today's challenges. Immunohematology. 2000. 16(4):131-7. [Medline]. de Figueiredo M, Lima M, Morais S, Porto G, Justica B. The gel test: some problems and solutions. Transfus Med. 1992 Jun. 2(2):115-8. [Medline]. Judd WJ, Steiner EA, Knafl PC. The gel test: sensitivity and specificity for unexpected antibodies to blood group antigens. Immunohematology. 1997. 13(4):132-5. [Medline].